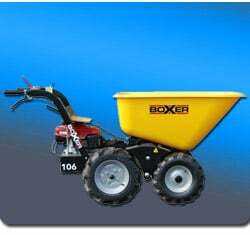 The Boxer Power Barrow is a motorized 4 wheel drive wheelbarrow that climbs over obstacles and up steep inclines carrying up to an 850 lbs load swiftly and safely. With a dependable Honda gas power engine and an easy access design the Boxer 106 is easy to maintain. This go anywhere machine is exceptionally stable yet the center of gravity allows for easy load dumping without the added expense of a powered dump mechanism.